UK retailer GAME is currently offering a 1TB PS4 Slim Triple pack for only £179.99. 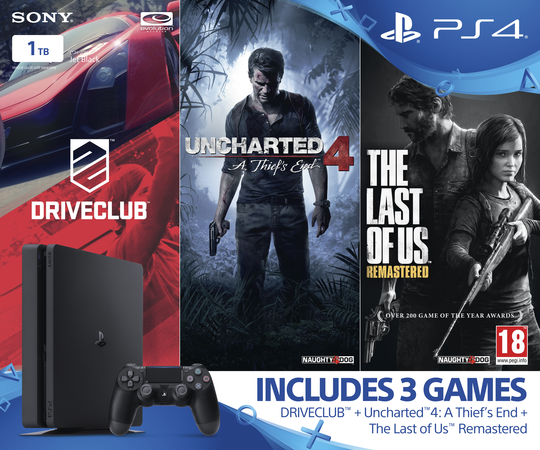 The pack includes the new 1TB PlayStation 4 Slim and physical copies of Uncharted 4, The Last of Us Remastered, and Driveclub. We’ve only encountered this specific bundle in the UK and is also listed on Amazon UK via various retailers. Normally, prices range from £285 to £319 so the deal is quite lucrative. The new, slimmer 1TB PS4. A physical copy of Uncharted™ 4: A Thief’s End on Blu-ray Disc™. A physical copy of The Last of Us™ Remastered on Blu-ray Disc™. A physical copy of DRIVECLUB™ on Blu-ray Disc™. Sony released its toned down version of the PS4 back in September of this year. The Last of Us Remastered, Driveclub, and Uncharted 4 are all PS4 exclusive AAA titles, with Uncharted 4: A Thief’s End being the most recent title in the pack. Those in the UK looking for a great PS4 Slim console deal should look no further.